Although he lettered in four sports (football, basketball, baseball, and track) at Unatego High School, New York, it was basketball that captured the heart of Rich Utter. His first coaching job was in Elfrida, AZ, but he moved to Rincon High School in 1981 beginning a coaching career that spans four decades and still continues. Utter coached both boys’ and girls’ basketball at the JV level, before becoming the varsity boys’ coach in 1989. The Rangers have won numerous divisional titles and made frequent appearances in the state tournament finishing as state runner up in 2006. 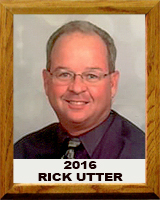 Utter ended the 2015-16 season with 418 varsity wins placing him third on the list of Tucson’s winningest basketball coaches. Utter has also served as volunteer coach for numerous youth teams with Sporting Chance, YMCA, and Parks and Recreation. Described as a “Team First” coach by the Arizona Star, and “the Dean of Southern Arizona Basketball Coaches” by Buena High School Coach Dave Glasgow, Utter has earned his share of recognition, twice being name Coach of the Year. However, it is the opportunity to teach, both in the classroom where he worked as a math teacher for 33 years and on the court that has provided the most satisfaction. As Justin Harden, Rincon alum now coaching in Florida wrote, “Coach Utter has presided over a successful program by creating a culture where players are comfortable to approach him to discuss life and basketball. He is willing to do so much for his players to put them in a place to win—not just games, but in life.” For Utter, that sums up the essence of coaching.